4622 LOC SWITZERLAND (1939) Truck*. Auto*. Pack horse*. Hikers*. 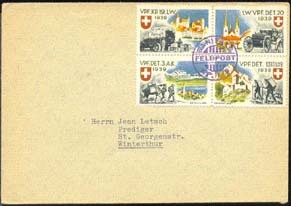 Feldpost envelope with cancelation of SANITAS KP I/5 and block of 4 different Festung Sargans military stamps showing different modes of transportation.